Over the years, my iTunes library has grown in size from “manageable” to “humongous.” As I continue to add more content—music files, videos, podcasts, and more—my iTunes library sure isn’t getting any smaller. I have generally resolved this problem by increasing the size of my iTunes-housing hard drive. But my current computer, a Mac mini, is more limited in this respect. The version I have includes a 256GB SSD along with a 750GB hard drive, which I got specifically for my iTunes media. It doesn’t take much to fill up a hard drive that size. While I admit that my music library—around 80,000 tracks—is very large, I don’t have a lot of videos. 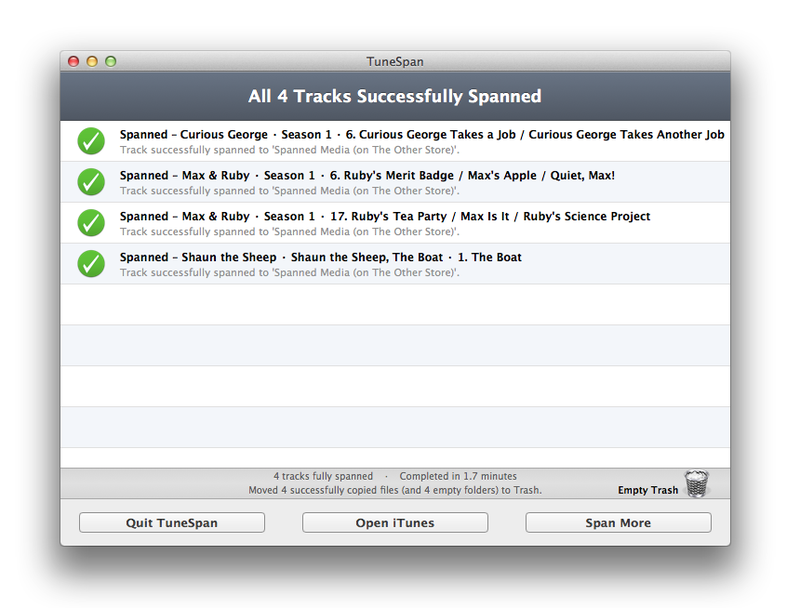 But I recently bought the first four seasons of Breaking Bad in HD from the iTunes Store—which take up 90GB of space. Add to that a number of discs from my DVD collection that I ripped, and I’m amassed a couple hundred gigabytes of videos. So I, like many iTunes users, have been looking for an easy solution to put some of my iTunes content on another drive, while keeping it accessible. In the past, you could create aliases of certain folders, such as Movies or TV Shows, and put them on another drive. But iTunes can no longer work with folder aliases. Another solution, creating symbolic links, works halfway: iTunes can read from these folders, but can’t write new content to them. Enter TuneSpan. This $10 app from Random Applications is designed to move, or “span,” some or all of your iTunes library to another drive. (Note that the developer lists $10 as a sale price, and says he may raise the price to $15 in the future.) You can even move part of your library to one drive, and another part to a different drive if you wish. Here’s how it works. 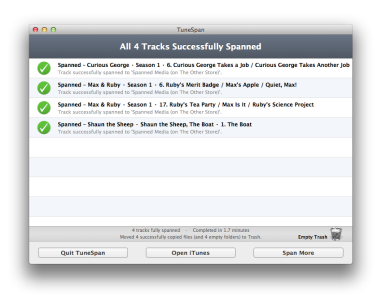 When you launch TuneSpan, it examines your iTunes library to generate a list of all your content. Even if you have a large library, this only takes a minute or so. The program then displays its main window, which is similar to that of iTunes. You see your playlists in a column to the left, and a navigation bar lets you choose to examine all your content, or just one kind (Music, Movies, and so on). To start with, you choose where you want to move your content. Just drag the folder on the other drive you want to use to the Click Here Or Drop Folder To Select Span Location well at the bottom of the window. Next, pick the content you want to actually move. 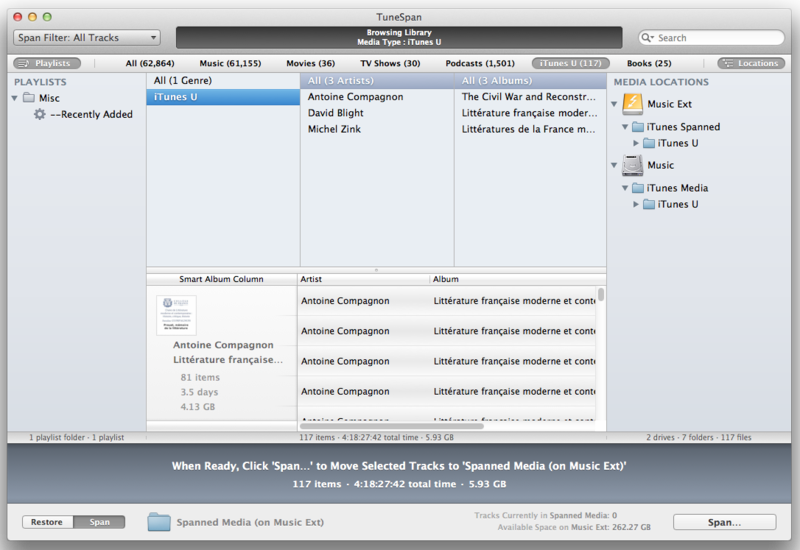 Here I'm using TuneSpan to move some of my iTunes U content. I chose to move my podcasts and iTunes U content to an external hard drive. I clicked on iTunes U in the navigation bar, then dragged the iTunes U “genre” to the section that says Drag Media Here To Select For Spanning. Clicking the Span button starts the process. TuneSpan examines the files, and even warns you if it can’t find some of them. It then displays a dialog box giving a detailed explanation of what will happen. You can choose how many attempts it should make to complete the span, whether to move the original files to the trash after copying, and more. Clicking Span on this dialog box begins the process. A small progress window displays while the files are being moved and your iTunes library is updated. This may take a while, depending on how much content you are moving (like those four seasons of Breaking Bad, say) and how fast your data copies. While there is a progress bar, there is no time estimate to help you know when the task will be completed. When the process has finished, TuneSpan displays a window showing all files that were moved along with any errors it may have encountered. TuneSpan shows you the results from your span, and lets you continue on from the results screen. You can continue to use iTunes while TuneSpan does its work (although the app warns that heavy iTunes usage could slow down the process). When things have been moved, you can sync your content just as if it was in your iTunes Media folder. And that’s the beauty of TuneSpan: not only does it move your content, but you can play that content from iTunes, sync it to iOS devices, and even access it via Home Sharing on an Apple TV or iPad, for example. When you’ve “spanned” part of your iTunes library, and add more content, you may want to move that new content to the secondary location. This is easy to do: just select the same part of your library and span it again. For example, I’ve placed all my podcasts on a separate drive. After I’ve downloaded new podcast episodes and I want to move them, I don’t need to select each one, but simply select the top-level Podcasts folder; TuneSpan will find which files need to be moved. However, there is one weakness in the program. If you want to span a subset of one of your libraries—say just one genre of your music or a specific TV series—and choose it manually, you can’t save this selection in order to run it again in the future. You need to select each of those items again to update the files when you’ve added more. Ideally, the ability to record all the genres, artists, TV shows or libraries (Podcasts, Movies, and so on) would make this more practical. It would allow a one-click update of all the content you want to store on a second drive. 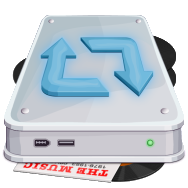 In the meantime, the somewhat magical way that TuneSpan resolves the problem of having too much iTunes content makes this app a must-have for those with big media libraries. If you’ve suffered from trying to parcel out your media files to different disks in the past, TuneSpan will simplify this process, allowing you to store everything in your iTunes Library, but not in your iTunes Media folder.